This salad is a mouthful in every sense of the term. As the title stretches to accommodate as many descriptors as I can fit in, my lips are still tingling with the last drops of dressing. Sometimes, even usually, salads aren't known for filling up much of anything. But this thick, spicy dressing really wakes up the tongue on a dreary, rainy spring day such as this. Good thing, too, because the sky is so low that the middling, wanna-be sky scrapers which I can see from my window manage to reach all the way up, like Himalayan mountains crowned by cotton. So even if outside the weather is insisting on April showers, a salad of strawberries and baby spinach helps to bring back some of the magic of spring. And when you combine dates with curry, you're left with a thick sauce, more than a dressing, with a real kick from raw onion. This is not the sort of thing with which you want to douse. 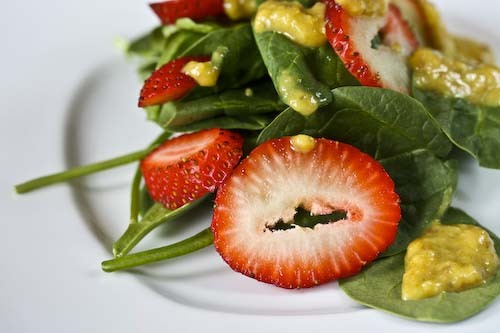 A few dots on your spinach leaves, enough so that each bite bursts into contrasts of sweet strawberry and spicy dressing. And with minimal oil to boot. I've used only strawberries and spinach here, but you could dress it up a bit with chopped nuts or raisins or substitute apples or, really, anything you like. It is only a salad, after all. And anyway, when you've gone to the (very minimal) trouble of making your own dressing, even a few handfuls of leaves and a bit of fruit seems special. Dump all of the ingredients for the dressing, except the oil, into a blender or food processor. Blend or process for about 1 minute. Add the dressing, with the machine still on, in a thin stream until well incorporated. Serve over a mélange of spinach, strawberries and whatever else strikes your fancy. Adding strawberries to salads is my favorite! I can't wait to try this dressing out. Thanks Andrea! Adding nuts would definitely a great addition to this salad. The dressing is so unique and sounds amazing! I am so loving this simple salad with the dressing as the star. 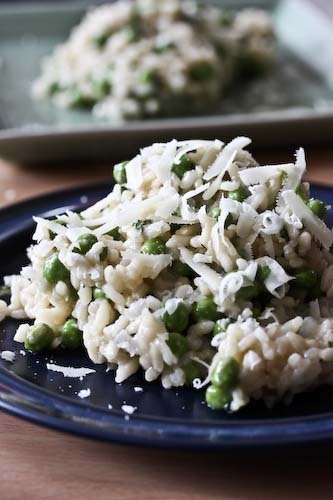 Great way to use some spring produce. Wonderful! What a way to ring in spring! People around here have been saying the strawberries from Costco are really good. I'll have to pick some up just to try this salad! Sounds new and different to me. Nice way of adding strawberry in the salad. I love the simplicity of this salad. I am going to bookmark this and make it when I have fresh strawberries!